In its May 8th decision, the Supreme Court couldn’t have been plainer as to the priority of pension obligations in the state budget, and placed the greatest portion of the blame for the condition of the pension funds squarely where it belongs: on the State Legislature. Once the employee retired, the entire payroll cost for that employee goes off the district’s books, so why should the district care? The State’s now on the hook for the entire pension cost. It also created higher property tax bills to pay the additional salary and penalty plus the additional pension cost to the State. 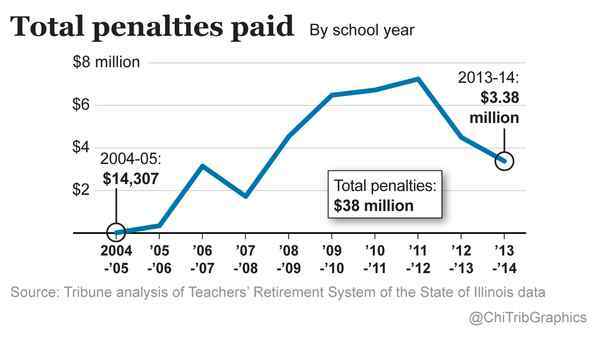 In the 2013-2014 cycle, McHenry County schools paid over $645,000 in penalties to pad the salaries and pensions of 229 district employees. You can find out how much your school district paid in penalties here. If you’re in the Johnsburg or Prairie Grove school districts, you’ll really find this interesting. Union Employees: Every time the subject of pensions is brought up, the first people we hear from are the rank and file, who point out that they’ve paid in every cent they were supposed to, that none of this is their fault. Wrong. Public union employees bear the responsibility for the leadership they elect. The membership sat idly by when those same leaders went to Springfield and told legislators that it was OK to not fund the pension plan if the money would go into the education budget. They knew what was going on and said nothing, figuring that the State would have to come up with the money somewhere. To now say that they’re entitled to collect from the taxpayers that which their own leadership bargained away is hypocrisy. To the extent members of the other unions sat on their hands while their representatives bargained away their pensions, they don’t have any cause to complain now, either. An Apathetic Public: Despite what was at stake in the last election, voter turnout in the March, 2014 primary statewide was 19%, and was just over 40% in the November general election. Pensions are negotiated between the unions and the people of this state through their representatives. Like it or not, the people of Illinois are a party to this transaction, and if they don’t care enough to get rid of those who are supposed to be representing them at that table, they’ve got no more right to complain than the union members. So it’s clear that nobody’s coming to the table with clean hands. It’s usually this type of circumstance that ultimately ends up with a negotiated settlement that all sides can live with because nobody gets everything he wants. It’s time for the parties to stop posturing and pointing fingers and get down to the business of fixing this mess. I’m on record as supporting the termination of the current plans, calculating and protecting vested benefits and moving everyone to a defined-contribution (401-k style) plan. If there’s a better solution to be had (and Bruce Rauner’s proposal has merit), I’m willing to listen. This entry was posted in Public Pensions and tagged Bruce Rauner, General Assembly, Illinois Supreme Court, Pensions. Bookmark the permalink.